A mostly-mellow-- with a few intense moments--float (inner tubes recommended) through downtown Jackson. You can even use public transportation for the shuttle. Jackson can get pretty hot. When it's too hot to run or bike--or you're too tired from running and biking you need a rest -- enter Flat Creek. The creek lives up to its name, mostly. A couple of downed trees and little drops infuse what is otherwise a sleeper inner tube float with short bursts of adrenaline. If you go too late in the season, expect to scrape the bottom. Wearing water shoes with hiking treads on them is a smart thing to do. As Flat Creek, whose headwaters lie in the Gros Ventre Wilderness, up beyond the starting point for the hike up Sleeping Indian, winds its way through downtown Jackson, it offers several different places to put your tubes in and take out. In addition to treaded water shoes, bringing a paddle (more to push off from the banks than to paddle with) is not a bad idea. 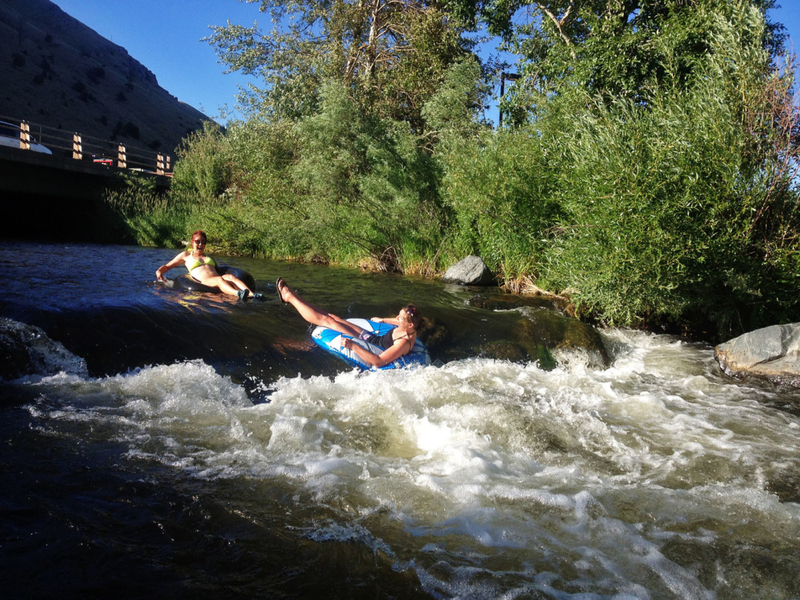 When it's too hot to run or bike, hop in your tube for a trip down Flat Creek. To do Flat Creek Complete, it's Dairy Queen to Smith's. Do it this way and Teton County's public transportation system can even be your car shuttle: park your car at Smith's Grocer (stop #60 on the free Town Shuttle) and get onto the START Bus' free Town Shuttle and take it to the Jackson Hole Historical Society (stop #31) on the route. Walk north along Cache to the Dairy Queen. If you feel the need to pop into this fine eatery and grab yourself a Blizzard, you should. Blizzard or not, Flat Creek is just behind DQ. Put your tube in and go. Smith's Supermarket is not the only place you can float Flat Creek to and take advantage of the Town Shuttle. Stops 44 and 45 on the Town Shuttle are a short walk from another take-out option. (Where Flat Creek passes beneath Snow King Ave.) These stops make the float about half the distance it would be if you went all the way to Smith's. If you don't need the public transport option, Russ Garaman Park is about 1 mile shorter than taking out at Smith's and has a beautiful creekside picnic area. Big O Tires in the K-Mart Plaza sells no frills inner tubes.